I don't know if I'm losing my marbles or just my self control, but yet again I find myself chowing down on a pint of Graeter's and I don't want to stop. The purists might say I have no appreciation for the chip infused flavors, but these sweet non-chip flavors are just so excellent. Let's begin. I found myself at Price Chopper about a month ago, and what do they have in stock but Graeters! 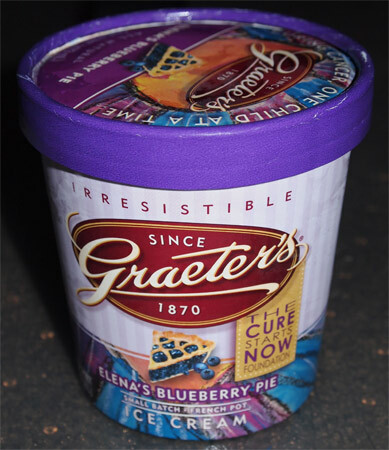 And not just any old chip flavor, they have this very purple container of Elena's Blueberry Pie Ice Cream. 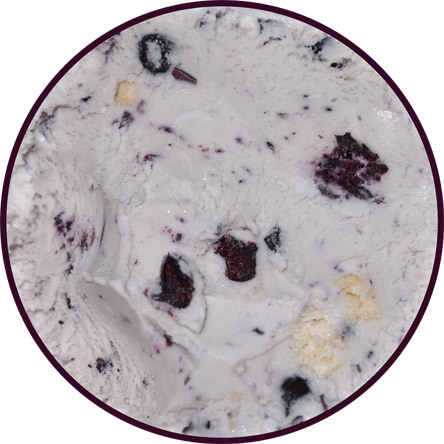 I couldn't resist and brought home "Rich vanilla ice cream with luscious blueberries and tasty bits of flaky pie crust. An irresistible flavor orignially created by a loyal Graeter's customer for the benefit of The Cure Starts Now Foundation." Mmmmm, ice cream for charity ALWAYS has my support. Oh man, that use to be vanilla ice cream, but my little friend is quiet blue isn't he. 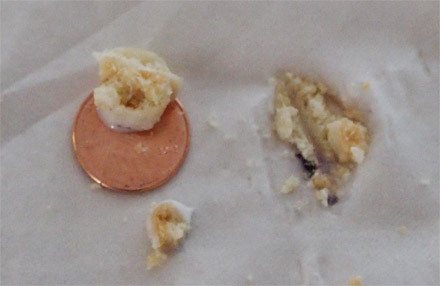 The very first bite was a blueberry smack across the face, and I mean that in an all natural and non-violent sort of way. You never know how strong a flavor will be, and this one showed up ready and willing to win me over. I even paused for a moment, debated if this flavor was for me, but then pressed on because, well, I wanted those crust bits. Check out the whole blueberries! Wow, Graters really does make a sweet flavor don't they? I'm a sugar fiend and these pints are right up my alley. Now take that sweet base and mix it with some excellent pie crust bits. I love pie in general, but my favorite ones are the ones that have crusts full of sugar and have that graham cracker like consistency that wins me over bite after bite. Eventually I did stop, but not until about two thirds of the pint is gone. There really is this textural pureness to the small batch french pot process. Like I said, I'm not that big a fan of blueberry flavor, but the texture, the sweetness and the crust make Graeters a winner yet again. On Second Scoop: Be careful when attempting the sniff test on the second scoop because this one is potent. I took a few more bites (it's been all of 3 hours since the first scooping) and the blueberry really is potent... but as soon as I have a crust bite I'm back in happy land. Mmmmm, crust. Side note: don't read about kids with brain cancer while trying to do a review. I wanted to know what the charity was for and now, well, now I don't really feel like talking about ice cream. Poor kids, I know they are in a better place now but it makes me sick to think about how the parents must feel. Every day is a gift and the thought of not getting daily hugs from your little ones is unbearable. I've been looking for this flavor everywhere! Where'd you find it? Price Chopper, but I think it was just dumb luck really. Yeah I've always passed this one at Price Chopper but the pie crust pieces turned me off. I might have to overlook my bias and give this one a try though. When I saw this in the store, I was interested in buying this but I thought it was blueberry ice cream and not vanilla! Graeter's needs to put a description on their pints, unless they did and I didn't see it. Anyways, I'm glad you reviewed this because I would have been disappointed. So, I ended up buying Haagen-Dazs's Blueberry Crumble. Their cobbler pieces had all of the components of an awesome pie crust! They're sweet and actually crunchy! But they were tiny and too few for my preference. 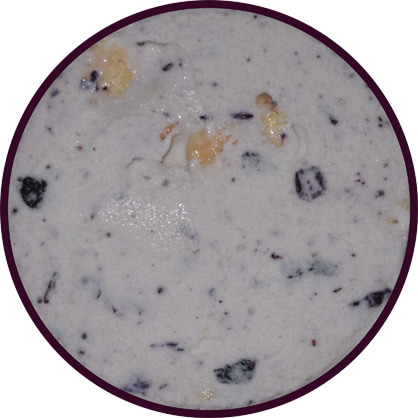 Also, the Blueberry Crumble ice cream had a strong blueberry flavor,too, but just as you said that this flavor mellows out, too, so did the Haagen-Dazs's one; I actually appreciate the freshness of the ingredients, too - no artifical flavors or anything fake. I'll bet these two flavors are similiar in taste, but I still want to have to check this out because it might be have a less potent blueberry flavor than the Blueberry Crumble I had. I just wish the stores would sell it for cheaper than $5.99! Until then, I'll stick with Ben and Jerry's Blueberry Vanilla Graham Greek Frozen Yogurt which was way better. I actually had to steal that description from their website, otherwise I would have assumed it was just blueberry ice cream (not that there is a huge difference). The big whole blueberries are a nice touch in this one. Whole blueberries?! You've got my attention now! 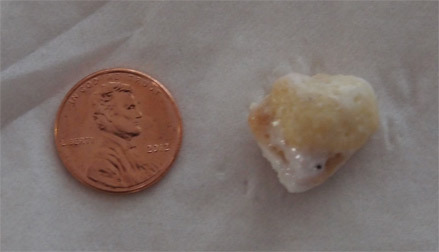 Breyer's Blueberry crumble had very few berries and tiny berries. I love this one! I made a float today using Sea Dog Blueberry Wheat Ale and it was AMAZING!! !